She may not be communist, as the National Rifle Association has begun to call her. It is most likely that he is not a communist, to be clear, but neither does she have to be a communist for me to admire the determination with which she has stood up for arms control. Her name is Emma González and she is a descendant of Cubans. She wasn’t supposed to go through what happened, crouched in what a madman did in high school with a combat weapon. Nor should she have become the leader of a movement that demands the right to life over the right – “blessed be the Second Amendment” – to own and bear arms. Politicians over the age of eighteen should be responsible for ensuring the safety of citizens. “If the president comes to tell me in my face that he regrets this tragedy, which should not have happened, I would ask him how much money he receives from the National Rifle Association,” she had cried out to the crowd outside the Fort Lauderdale Federal Court, just days after the massacre, to ask the government for regulations to stop the lucrative arms trade. But Trump, who often has the delicacy of a hippopotamus, didn’t think it would be a good idea to ban the sale of automatic rifles to citizens with psychiatric histories. The first thing that came to his mind – and he shot off his mouth without thinking too much – was the proposal to distribute weapons to teachers and students, bulletproof vests. After that, turn it off and let’s go. Luckily, Emma Gonzalez and the rest of Parkland’s survivors have it made it clear: they had warned about Nikolas Cruz’s mental problems and are sure that the nineteen-year-old boy would not have done so much damage with a knife. It is true that spooky assaults do exist, because some people cut themselves and even kill themselves with machetes and knives at popular festivities or in any corner fights, but there is no comparison between the magnitude of both types of killings. That is why, on Saturday, March 24, 2018, while young people, adults, the elderly and children were demonstrating in the main American cities, and in cities around the world the, rise of the pacifist movement gave it a universal character. 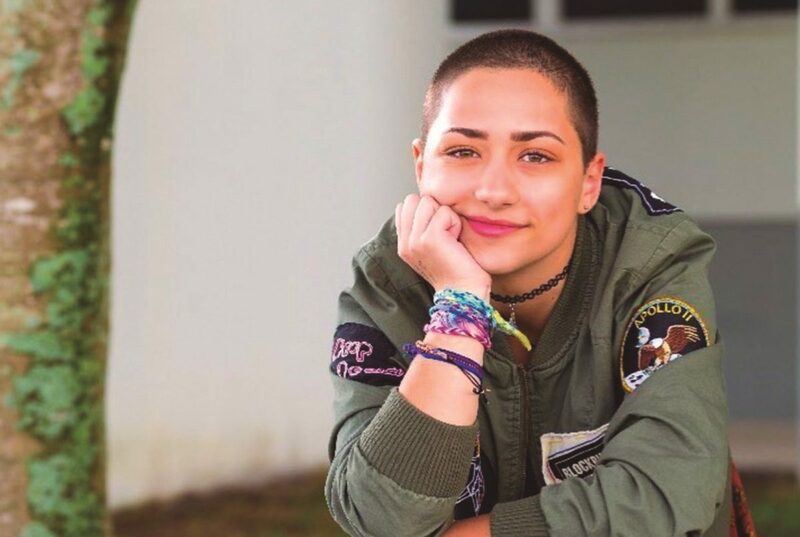 Emma González, wearing an olive green jacket with a Cuban flag sewn on her right shoulder, stood in front of the microphone in Washington and was silent; a silence of almost six minutes and twenty seconds, just the time it took the shooter to kill seventeen students and traumatize a school, a city, a state, a country forever. Emma González, a descendant of Cubans, knows it like no one else: there are silences which speak volumes. Originally published in the blog Cubaprofunda.